On April 24th 2008 I had to travel to Zürich in Switzerland for a presentation about Oracle at Trivadis Technical days. First I planned to start a day earlier from Ljubljana airport (LJLJ), but a heavy fog on April 23rd prevented me to depart. The fog prevailed until noon. So I decided to move the airplane back to my home airport in Divača and start early next morning. The plan was to cross the Alps in the northern direction to Salzburg in Austria and do a refueling stop in Schärding (LOLS) in Austria, located a few kilometers from the border with Germany and then continue to Essen/Mülheim (EDLE) close to Essen in northern Germany. There I should exchange the transponder with a new S-mode one and continue to Birrfeld (LSZF) near Zürich where I had the presentation on Friday, April 25th. My colleague from OakTable.net Eric Grancher is working in CERN and he organized a guided visit of this interesting European Organization for Nuclear Research on next day, Saturday April 26th. The beginning of the journey on Thursday morning, April 24th, was a little bit disappointing because of the clouds covering the Alps in the planned direction. So I had to slightly change the plan and fly first to Graz and try to cross the Alps more to the east where they are a little bit lower. When I was avoiding the Graz CTR I god a PIREP (pilot report) from somebody who had just crossed the Alps and he reported that the tops of cumulus clouds are at about 9,000 to 10,000 feet. As I was unsure how high I can go because until then the maximum altitude was 9,500 feet, I decided to fly further in direction to Vienna and cross the Alps at lower altitude. I was afraid that the clouds would start to raise and I wouldn't be able to climb higher. When I passed Graz I started climbing and at 10,000 feet I was about 1000 feet above the tops of the clouds and at that time I decided to turn directly to Linz and further on to Schärding. There were a lot of holes in clouds, about 5/8 to 6/8 of the sky was covered with nice cumulus clouds. In METAR report this would be depicted as BKN (broken). In a case of engine failure it would be possible to descend below the clouds and find some suitable terrain for emergency landing. On the northern side of the Alps, in Lower and Upper Austria, there were almost no clouds. I maintained the same altitude until I passed Linz CTR and start the descend to Schärding. Schärding - Suben is a very nice small airport in Upper Austria with an asphalt runway 800 x 21 m. I have chosen this place for refueling because they have also mogas which is substantially cheaper than avgas. My Piper is a registered German aircraft and has a STC (Supplemental Type Certificate) for mogas and it would be crazy not to use cheaper gasoline whenever it is available. Since November 2007 I was using mostly mogas. Schärding-Suben airfield requires a prior permission (PPR) for landing so I had to send them an email in advance. The other possibility is calling them by phone before the departure. The tower crew is very nice and helpful and after landing you can taxi directly to the fuel station and start refueling. The refueling took about 10 minutes and after some time looking around the nice airfield the flight continued towards Essen / Mülheim (EDLE). After departure from LOLS and crossing the river Danube I was climbing back to 9,500 feet in the direction to Ansbach NDB (ANS) which is located at the Ansbach airfield (ETEB) south-west of Nürnberg. Unfortunately it was already noon time and the tops of the clouds were now rising rapidly and also a line of thunderstorms formed extending from the north of Germany to Bavaria. So I had to descend lower and lower and when I was flying only about 2,500 feet AGL I requested a weather information from Munich Information. The weather was worsening rapidly and the suggestion I got from ATC was to land at nearest airport in Ingolstadt Manching (ETSI), a military airport with two runways and also a small civil terminal. After 30 seconds of considering what to do I turned towards ETSI and landed there. It was a hard decision, but for sure the best and the most safe one. Because of this unplanned landing there was no chance to exchange the transponder at EDLE airport. The ETSI personnel was very nice and helpful and they gave me free wireless access to the Internet to check the radar images. After 2 hours of staying in the nice terminal building the thunderstorm line moved to the east and the weather improved enough to continue the journey. I decided to continue directly to Switzerland. Unfortunately ETSI has no customs service so I had to make another stop in Augsburg (EDMA) to clear the customs. Switzerland is not yet among the Schengen countries. The personnel in Ingolstadt armed me with the map of Augsburg airport. I haven't filed a flight plan as usually in Germany pilots don't file a flight plan for inland flights. The flight took only 28 minutes and with the exception of the shower over the Augsburg airport it was uneventful. 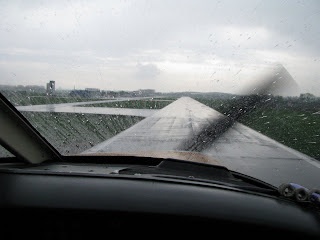 When I was already in the CTR a pretty heavy shower passed the airfield and it was still raining when I was landing there. It took about 30 minutes to clear the customs and continue towards Switzerland. Augsburg was for sure the cheapest airfield with only 8 EUR of landing fee. The flight from Augsburg to Birrefeld was nice and without any problems. The weather was fine although there was a lot of clouds with the base at about 5,000 feet. Before crossing the Swiss border I switched to Zürich information until few minutes before landing at Birrfeld (LSZF) near Zürich. First I planned to land at Zürich International airport but due to higher fees and only avgas availability I decided to land at Birrfeld. This is a very nice small airport with a lot of traffic. There is nobody in the tower so every pilot has to strictly follow the prescribed procedures and report his positions. Unfortunately the instructions on the web are available only in German language. They have also a special approach chart which must be strictly followed to reduce the noise over sensitive areas. Next morning it was raining in Zürich and the weather was marginal for the VFR flying. I was so happy because I arrived a day before in nice weather and therefore I had a lot of time to prepare for my technical presentation. After I have finished the presentation I rushed to the Birrfeld airfield where I did the refueling with the mogas and continued towards Geneva. When I was still at home I studied the Geneva airport information in details and found a requirement for a ground handling agent. I have contacted one of the agents and they required about 260 CHF (about 160 EUR) for landing there. This was much to high so I decided to land in France at Annemasse (LFLI) where the the landing and overnight parking was ten times less. The regime at LFLI regarding the ATC is the same as it was in Birrfeld - there is nobody in the tower and everybody has to report his position and be careful about other aircrafts flying in the traffic pattern. For all airfields in France one can get the required official detailed information at SIA, for instance for LFLI the information is available here. A very interesting site for acquiring the detailed information for all small airfields in France is QFU which offers a direct link to SIA on the airport detailed page. Next morning I visited CERN and was impressed by the technology used there, especially the new accelerator which went into production in June 2008. This was one of the last possible slots to visit the accelerator before the experiments started. In the afternoon I decided to make a direct flight to the home airport at Divača. The route was LFLI - SIO - Simplon pass - Bellagio - Verona - VIC VOR - VEN NDB - Jessolo Lido - Caorle - Grado - Trieste - LJAJ and Divača. The first part of the flight was following the coast of Geneva lake towards the start of the valley which leads to Sion (LSGS) and further on to Simplon pass. After clearing the Geneva CTR I started climbing to 10,000 feet to overfly Simplon pass. This was my most spectacular flight - on the left and the right there we mountains with peaks between 3000 and 4000 meters and the weather was incredible. Near Brig I crossed the Simplon pass and continued to northern Italy. At the same time I switched to Milano Information. The airspace north of Milano is A-class airspace from 1500 feet AGL to FL195 so VFR flights are prohibited. However, on the northern part of this airspace it is possible to fly VFR up to FL125. The exact border line can be found in Jeppesen VFR chart for Italy (LI-1). There were some clouds in Northern Italy so I decided to climb to FL120 to clear them and also to check if my Cherokee is able to reach this flight level. The other part of the flight was with no special events. I had to descend to FL70 until I crossed the Italy/Slovenia border at 4000 feet. The whole flight took 3 hours and 42 minutes. This was my first solo flight across Austrian and Swiss Alps. The weather was excellent, especially when crossing Swiss Alps. Unfortunately, I had also some bad weather on this trip and due to bad weather I had to make an important decision to land on the nearest airport. Also I had to change the plan and omit the visit to EDLE. When I am analyzing this decision I am still convinced that it was the only possible decision. Continuing the flight into bad weather could lead to unpredictable consequences. All the decisions I had to made during the trip were focused towards maximum safety and I have even sacrificed some mission goals to obtain maximum possible safety. This was really a very important lesson I have learned. I signed up at www.homebriefing.com which is a great web site for route planning and provides a detailed weather forecast for Austria and Switzerland. Especially GAFOR charts are extremely useful for VFR flying over Alps. I spent ten times more time for planning than for actual flying and all this time was really worth to spend in order to prepare myself for such a long trip. GoogleEarth was another useful resource for studying the airports details and also some parts of the trip, especially the part over Austrian and Swiss Alps. Really nice achievement! Good for you!